Hi! Happy, happy Monday to ya! 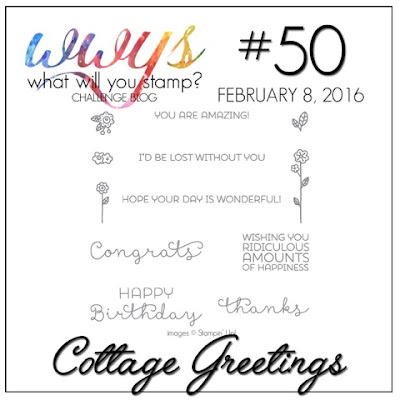 I'm back with another week of the What Will You Stamp Challenge Bog! 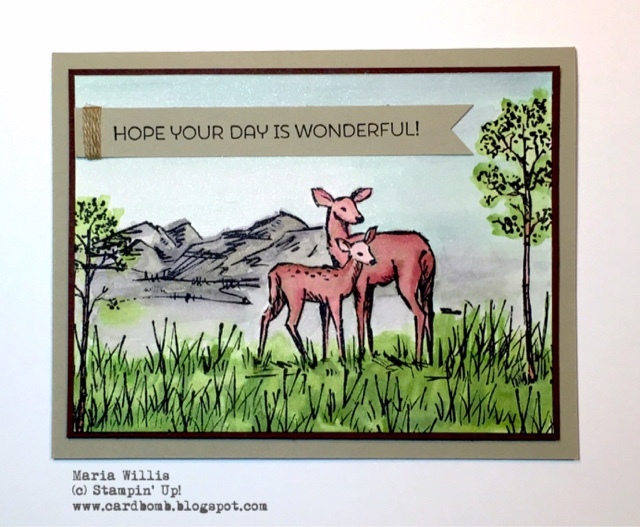 This week we are featuring Cottage Greetings! I love Cottage Greetings because it has such a great variety of sentiments. I also love the fonts! One of the fun things about featuring a set that is almost exclusively sentiments is that you get a little bit of creative freedom. I have been itching to use the new In the Meadow stamp set and thought that combining it with this sentiment from Cottage Greetings would work well. 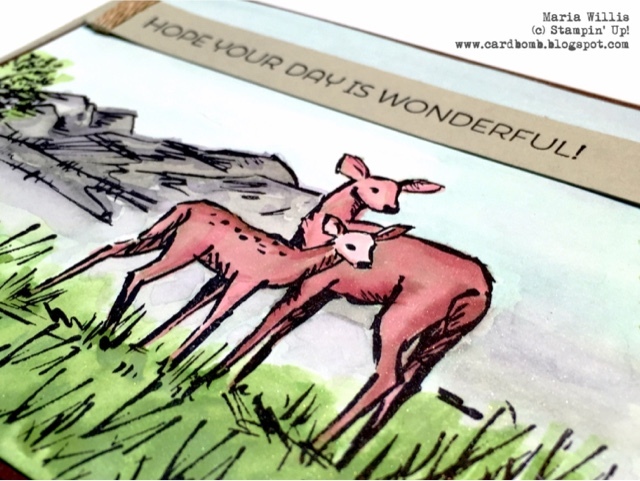 I used my aqua painter to water color these beautiful deer with Chocolate Chip ink. The grass and trees are done in Wild Wasabi and the background sky is a base of Soft Sky with a little bit of Smoky Slate and Wisteria Wonder for some extra depth. The mountains are painted with Smoky Slate and Wisteria Wonder. I stamped my sentiment on a strip of Crumb Cake card stock and wrapped one end with linen thread. I mounted my image on a mat of Chocolate Chip card stock and used dimensionals to adhere it to a Crumb Cake card base. I love the natural, peaceful look of this card and I sure hope you like it too! Thanks for stopping by to check out my blog today! It's always nice to have visitors. If you have a minute to leave a comment please let me know what you think about my card today. If you're interested in checking out the products that I used to make this card please check out the list below. If you have any questions please feel free to ask! *For a limited time only you can get $155 worth of Stampin' Up! products for only $99! Just ask me how-and in case you're wondering, there is no catch! Thank you! Hoping you all have a wonderful day! Please use this code if you will be ordering less than $150 in merchandise. Thank you!